In cartoons from my childhood, when a character got punched, their legs went up over their heads and they ended up in the clouds. There was a sort of endless cycle of characters flattening each other, only to spring back to life, to be resurrected. A lot of that sort of vaudeville stuff seems very life-like to me…I love work that looks like it’s about power, but I like it from an entirely skeptical point of view. The pomposity of it—it seems so comic as a depiction of desire. Betty Cuningham Gallery is pleased to open 3 Paintings and 3 Drawings featuring recent work by Robert Feintuch in the Gallery’s Sidecar space. The artist will be present for an opening reception on Saturday, February 24th from 4 – 7 PM. 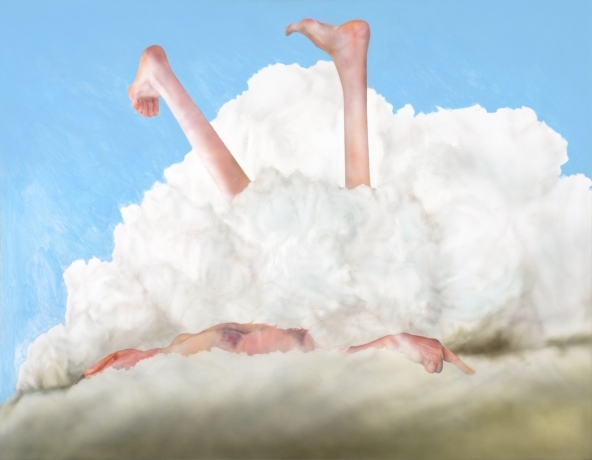 Currently at the Utah Museum of Contemporary Art is an exhibition featuring 11 paintings by Feintuch and 9 sculptures by Rona Pondick, titled Rona Pondick and Robert Feintuch: Heads, Hands, Feet; Sleeping, Holding, Dreaming, Dying. The exhibition runs from February 3- July 15, 2017. Robert Feintuch was born in Jersey City and studied at Cooper Union (B.F.A. 1974) and the Yale University School of Art (M.F.A. 1976). Since 1985, he has had solo exhibitions at Sonnabend Gallery, New York, Akira Ikeda Gallery, Berlin, Studio La Città, Verona, CRG Gallery, New York, Daniel Newburg Gallery, New York and Howard Yezerski Gallery, Boston. His work has been included in numerous international group exhibitions including shows at The Peggy Guggenheim Foundation (Venice), Ca’ Pesaro Galleria Internazionale d’Arte Moderna (Venice), Serralves Museum of Contemporary Art (Porto), The Rupertinum (Salzburg), Museum für modern zeitgenössische Kunst (Bolzano), The National Academy Museum, (New York), The Addison Gallery of American Art, (Andover), and in the Venice Biennale. Feintuch has been awarded fellowships from the Guggenheim, Bogliasco, Rockefeller and Leube Foundations, and the National Endowment for the Arts. The artist lives and works in New York City. The exhibition will remain on view through April 15, 2017.